In this video by Victoria Foxwood you’ll find detailed instructions for creating a wonderful in-place wooden planter for flowers or shrubs. It offers a way to transform a stump in your yard into the site for a vibrant new display of beautiful blossoms or shrubs. You won’t require extensive materials to accomplish this goal, simply a splitting axe and a wood chisel, a hammer, a battery-powered electric drill and a pair of gloves and safety glasses. Armed with these simple tools, you can follow five easy steps and achieve a gardening masterpiece. Since many different types and sizes of tree stump planters exist, these settings permit considerable variation in design. To ensure the best environment for your new flowers, try whenever possible to match the plants you grow in these sites with the size of the natural container itself. 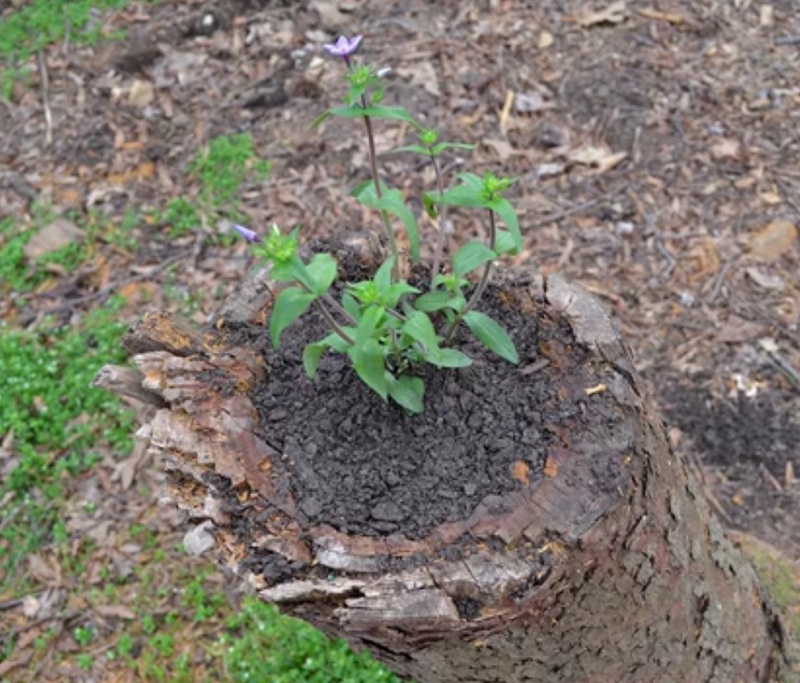 For instance, a very thin tree stump would provide an excellent shelter for several small flowers or a single plant, while a wider, massive tree stump might comfortably shelter larger shrubs or even a young tree. 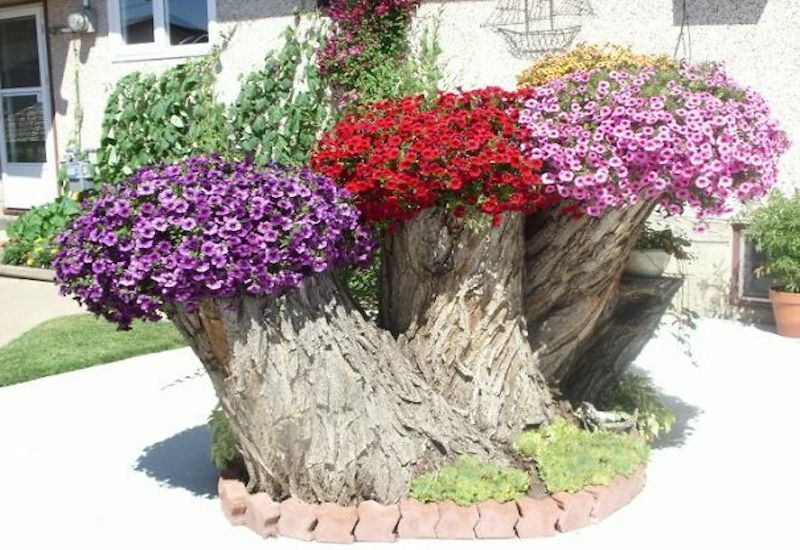 Your creativity in accomplishing the refurbishment of an abandoned tree stump into a colorful planting spot remains limited only by your imagination. Some people will want to add additional features to the final results, such as carving the exterior of the stump itself or adding background exterior lighting. The project offers an opportunity to let your imagination soar as you carefully transform a decaying eyesore into a living work of art. Select a stump in your yard for the project site. 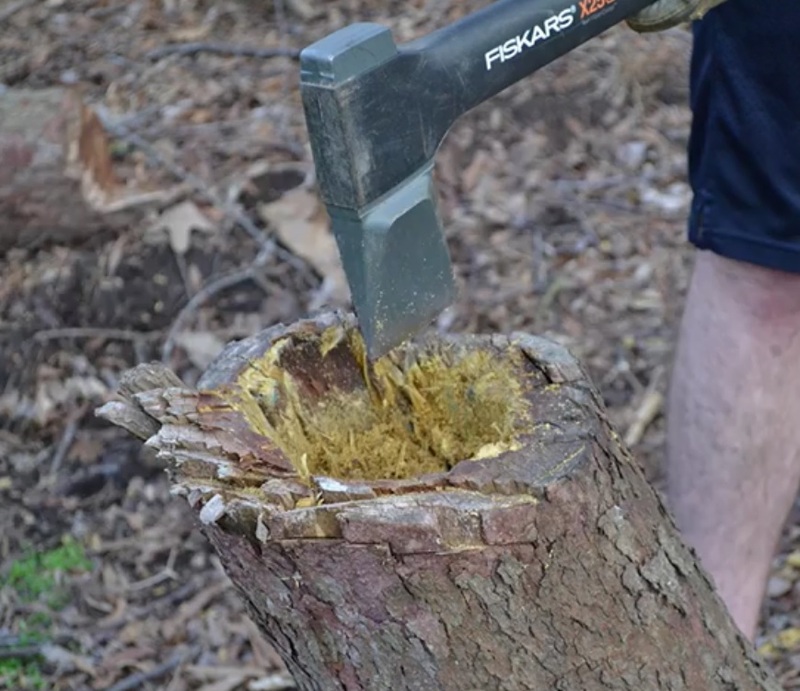 Then carefully use a splitting axe to even out the upper surface of the stump so that this area appears fairly level. Next, use several sharp blows of the axe to create a hollowed-out central core section. Using your electric drill, make a series of straight holes deep into the center of the core. 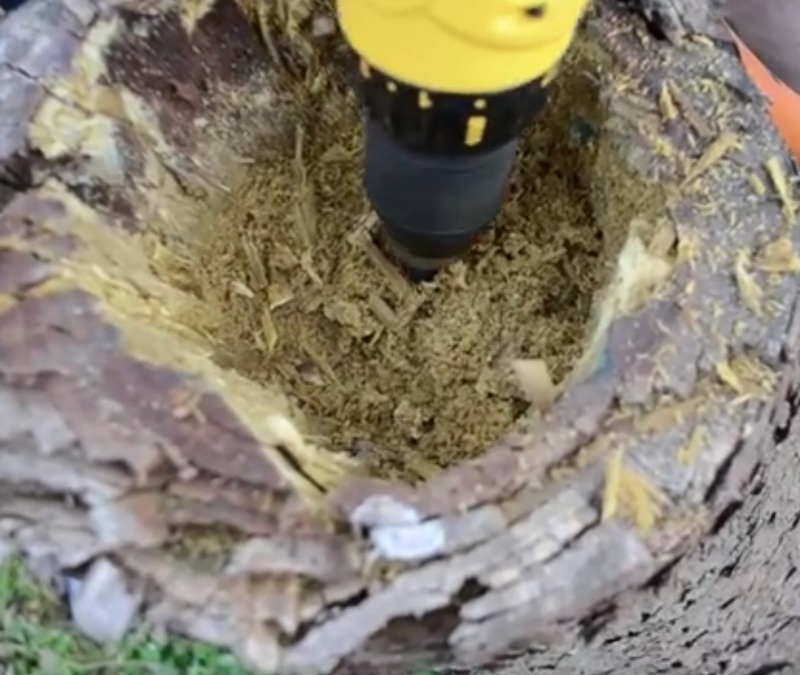 Don’t drill near the outer edges of the stump, because you want to leave the exterior intact. Place holes closely, so that you break down the fiber of the decayed pulp in the central zone. With your gloved hands, carefully dig out the wood chips from the interior of the old stump. Clear away the tiny particle of wood dust to reveal the exposed surface again. Now it should resemble an upright hollow stump. Carefully chip away at the weakened interior wood using your heavy hammer and a wood chisel in order to expand the hollow. Remove any thick chunks of remaining debris from this area. Remember to preserve the solid stump exterior! Finally, fill in the freshly hollowed interior of the old stump with loose potting soil. Add water to create a soft, moist growing environment. Plant your selected flowers and shrubs in this location. You can use either seeds or young bedding plants. Once your flowers become established within the new tree stump planter, you’ll enjoy a truly magnificent garden display!